Special Representative and Head of the UN Mission in Afghanistan (UNAMA) Ján Kubiš. Afghanistan took another step forward in protecting children from being recruited into and used by national security forces, a move welcomed today by the United Nations. The Government recently endorsed a so-called “road map,” supported by the UN Assistance Mission in the country (UNAMA) and the UN Children's Fund (UNICEF), in their roles as co-chairs of the UN-led Country Task Force on Children and Armed Conflict. “The measures outlined in the Road Map will, if fully implemented, serve to ensure accountability,” said the Secretary-General's Special Representative for Afghanistan and head of UNAMA, Ján Kubiš. He added that with proper screening and verification procedures will end child recruitment amongst the security forces, in particular the Afghan National Police (ANP) and the Afghan Local Police (ALP). “This will make a real difference in the lives of Afghan children,” the Secretary-General's Special Representative for Children and Armed Conflict, Leila Zerrougui, said. Among the measures in the 15-article “Road Map Toward Compliance,” the Government has agreed to screen all ANP and ALP units in order to release all underage recruits, and to establish a system to investigate, prosecute and take disciplinary action against those responsible for the recruitment of children aged under 18. In January 2011, the UN and the Government of Afghanistan signed an agreement in which the country made a commitment to protect children affected by armed conflict and to prevent the recruitment of minors into the national armed forces. The Action Plan set out various activities that the Government would undertake to address issues such as the strengthening of birth registration and age-verification mechanisms, investigation and prosecution of perpetrators of under-age recruitment and sexual violence. This plan was signed several months after the ANP was first cited in the Secretary-General's report on Children and Armed Conflict for the recruitment and use of children into its ranks. An additional reference to the ALP was added to the reports starting in 2012. 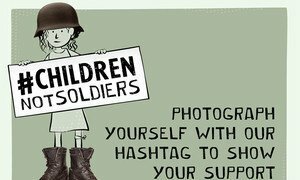 In March, Ms. Zerrougui and UNICEF launched 'Children, not Soldiers,' a global campaign to end and prevent the recruitment and use of children by government security forces by 2016. Afghanistan publically supported and endorsed this campaign. The United Nations today launched a new initiative to end the recruitment and use of children in Government forces in conflict by 2016, with Secretary-General Ban Ki-moon stressing that children should be armed with pens and textbooks, not guns.